Mizuno Wave Enigma 5 are neutral cushioned running shoes. 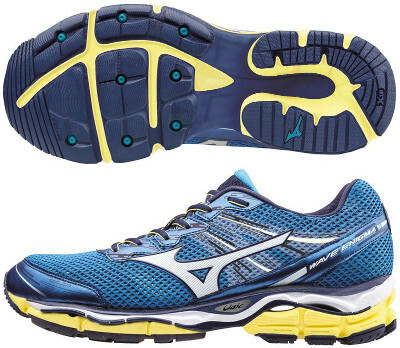 The Mizuno Wave Enigma 5 is the premium model for neutral runners from the japanese brand. Plenty of cushioning and with latest technologies onboard, the Enigma 5 features a softer response, but don't forget it is still a Mizuno. As well as in its smaller sibling the Wave Ultima 7, major change is the lighter material in the midsole (U4icX™, available in both heel and forefoot) which combined with the full length Wave™ plate provides a smooth and cushioned ride. An extra EVA foam layer under the innersole increases the comfort. The other big change from its predecessor the Wave Enigma 4 is the new upper based on the already known lightweight and breathable AIRmesh™ from the Wave Inspire 11 with improved fit provided by internal stripes (Dynamotion Fit™) following foot movement and featuring a secure transition.